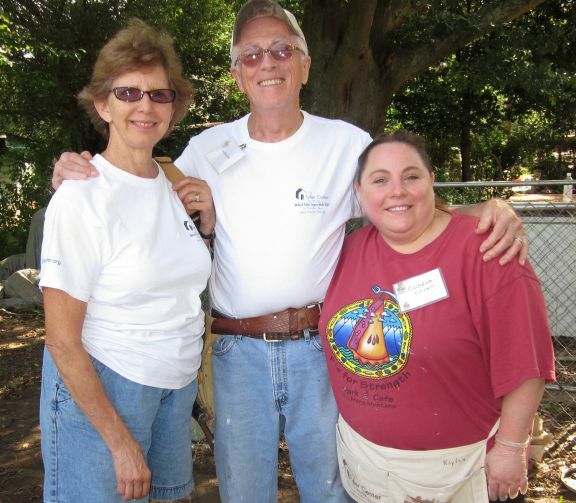 Volunteers at this year’s Millard Fuller Legacy Build hail from Minnesota, New Jersey, Arizona, Pennsylvania, Texas, Colorado … and the list goes on and on. But there also is a strong contingent of volunteers from the metro Atlanta area, which includes Henry County and McDonough, Ga., host site for this year’s Legacy Build. Among those is Penny Williams. Williams moved from Los Angeles to nearby Hampton in 2008 and is a member of Wesley United Methodist Church, which has been a huge supporter of this year’s build in hosting all the week’s dinners, the kickoff and closing celebrations and providing work space for The Fuller Center for Housing’s communications team. 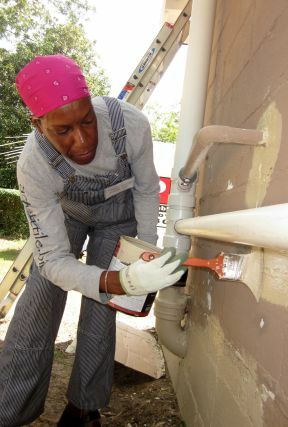 Just as her church has stepped up to support The Fuller Center’s efforts to improving housing in its backyard, Williams shares her church’s desire to help those in the Henry County area. Candy Strain was born and raised in Hampton and now lives in McDonough. After she and husband Tim spent years in housing as developers and builders, they changed course and bought a Great American Cookies & Pretzelmaker franchise at Tanger Outlets in nearby McDonough. And she is as sweet as her name would indicate, having spent years volunteering with Habitat for Humanity, feeding the homeless and working with special needs adults and children in Henry County. The star of the show at the Legacy Build on Wednesday after showing up with cookies and a cookie cake, Strain also prefers to work close to home. Willie Wilkerson hails from nearby College Park, Ga., and while he is happy to give back in the area he considers home, he has long been a familiar face on Habitat and Fuller Center builds across the United States and internationally, having been volunteering since 1983 with the affordable housing movement started by Millard and Linda Fuller. He said working outside of one’s home area has advantages. Wilkerson taught construction and math in Atlanta and Fulton County public schools for 40 years and spent 12 years as a substitute teacher. On Wednesday morning, he pulled away from his work at the Legacy Build to give back locally in a different way — by speaking to students at Henry County High School about his experiences in education and volunteering. Alpharetta’s Lisa Berkenberger likes to serve in the United States, having done all four Millard Fuller Legacy Builds. But she has international experience of sorts. She helped build the Global Village in Americus, Ga. A project long championed by Millard Fuller, the Global Village shows housing conditions in many international countries with replicas of the kind of poverty housing that exists there and the kind of affordable housing that has been built in those countries to alleviate those problems.